From the Fertile Crescent of Mesopotamia, traders carried the saluki throughout the Middle East, where they became the treasured coursing hounds of the nomadic tribes. Though their origins were still deeply rooted in the vast arid regions of the Middle East, European travelers brought Salukis back with them. There is evidence of Salukis in Belgium during the Middle Ages, but their presence outside the region of origin became most evident in the late 1800s. By the turn of the century, Salukis had arrived in England. The Saluki or Gazelle Hound Club was formed in England in 1923 and provided the first available breeding stock for those generations now residing on other continents. Walking Amherstia Salukis ~ who's leading who? One of the first breeders to import the Saluki from the Region of Origin (ROO) was the daughter of a prominent expert on Egypt, Lady Florence Amherst. She founded the Amherstia Kennels in England. Her Salukis were primarily from Egypt a "southern strain," taller, leggier, lighter in bone and with less feathering. They were true desert hounds, bred for both speed and endurance in desert conditions. Next came General Lance, retired from the British Army, who returned to England with Salukis he had acquired in Syria. These hounds, of a "Northern strain", were bred to hunt in the rough, colder, mountainous terrain of Syria, Northern Iraq and Iran. Stockier, heavier boned, with thicker coats and more profuse feathering, they were exemplified by the General's favorite dog, Ch. Sarona Kelb. Kelb was the first dog saluki champion in England. Kelb is behind the pedigree of many English Salukis. Ch. 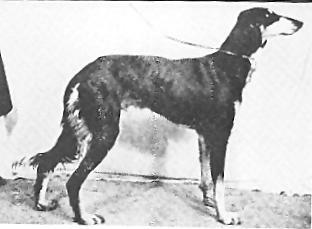 Sarona Kelb Since that time Salukis have been imported to North America and other continents where they have been bred by concientious, instrumental breeders and thus retain essentially the same traits and appearances as they have for centuries.